When you make your emergency plans, are you considering your dog? When SHTF, they will need supplies in many of the same ways people do. Food, water, tools, medical supplies, paperwork, hygiene items, and a toy or two to pass the time are all great things to consider. Dogs, unlike most other pets, can actually be very useful in disastrous situations. While it requires a good deal of training, dogs can be helpful with self defense, hunting, carrying equipment, and keeping watch. To support your pup in an emergency or when SHTF, you need to have plenty of canine resources on hand. You could add them to your pack, lessening the supplies you can carry for yourself or slowing you down. That is where a dog bug out bag can come in handy. A large dog is perfectly capable of carrying its own supplies- reducing your own bug out bag weight and making your pet more useful. If you get a bag the right size for your dog and get them used to it, they won’t even notice it’s even there. Food – 72 hours worth. Different breeds vary on how much food they require a day, but a basic guideline is ½ cup of dry food for every 10 pounds they weigh. Puppies and more active dogs can require more. It is best to portion off so you can feed dogs multiple times a day instead of just once. Besides cans or dry foods, you may also want to include treats so you can feed your dog without breaking out a large portion or feed on the go. Water – 72 hours worth. Plan to be on the move and more active than normal. Both you and your dog will likely need more water than you typically drink in a day. The amount of water you need varies, but is generally based on your dog’s size. A well hydrated dog drinks 9-17 ounces of water per day for every 10 pounds they weigh. You can add whatever amount of water your dog will require and add it to the supply you are carrying, but having them carry their own water is best for spreading out your resources- in case something happens to either water supply. Hygiene – Poor hygiene can cause disease. Pack some pet waste bags so you can keep your areas clean. Medical Supplies – Just like people, dogs are more likely to get hurt in emergency and disaster situations. Having first aid supplies for them is ideal, and be sure to add any medications they regularly take too. Tools – While a smaller dog may require a carrying case or cage, you need a way to account for medium and larger dogs as well. Pack a collar and leash at a minimum. Don’t rely on their training to stay by your side in an emergency. Dogs can act irrationally in stressful situations and a leash can make sure you are not separated easily. Paperwork – The boring requirements are often overlooked, and this is one of them. Having a copy of your dog’s information printed off and at least in a splash-proof container (ziplock) can come in handy. While you may not need it for a SHTF situation, it can definitely come in handy in an emergency or if you happen to become separated. Rabies vaccinations are especially important to have documented in emergencies, since most people are not willing to gamble with an unaccompanied and unvaccinated dog. While these are not completely necessary for a dog in an emergency, they are great to have around. If you have extra room and weight capacity in the dog bug out bag, you should consider these items. bag for a dog. The Goughnuts indestructible chew toy is GREAT for dog bug out bags (although it’s a little pricey) While it is pretty easy to make anything a toy for a dog, having an indestructible chew toy around is pretty great for everyone’s entertainment- not just the dog. Use it to play fetch, or just to let your dog get out some energy. 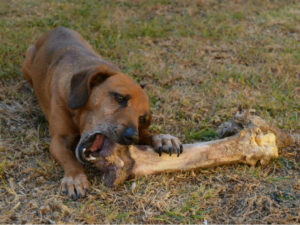 You could bring a bone for them to chew, but even the smallest dog can eventually wear out a bone. Collapsible Bowls – Bowls don’t take up much room when they are collapsed, and make it easy to give your dog food and water on the go with less waste. While pouring bottled water out and letting a dog lap it as it comes out works okay on a hike, you don’t want to be that wasteful in an emergency situation. Dog Boots – If your dog is not used to walking long distances, you may want to check out dog boots to protect their paws. They would take some getting used to ahead of time but can offer better protection if there will be a lot of walking on asphalt or through rocky terrain. Most people don’t opt to use them, but there are a few who swear by them and won’t take their dogs on hikes through rocky terrain without them. 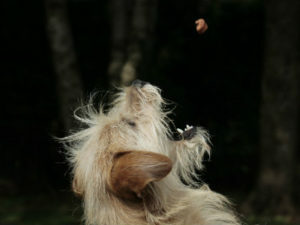 If you do end up keeping food and water in your dog’s pack, be sure to redistribute the weight as you go through them. You don’t want to let them eat all the food and water from one side of the pack without rebalancing. An unbalanced pack can cause extra stress over long distances and increase their chance of injury, so be sure to balance the pack before you harness them in. Practice with your dog. We mentioned this in an earlier section about getting your dog used to a pack, but you want to go beyond just wearing the pack. 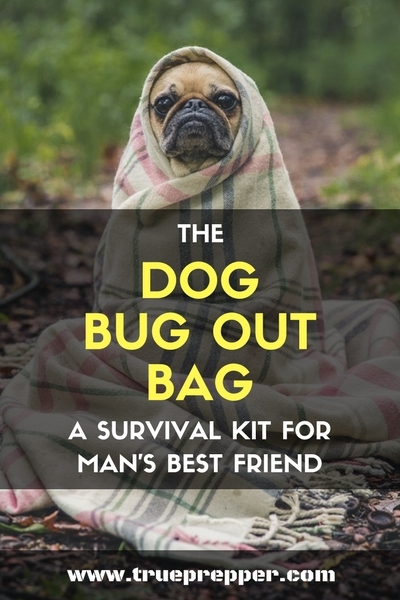 Load it up as you would for a bug out situation and get your dog some practice. You can use it as an opportunity to test out you and your family’s packs and make an exercise of it. Testing out plans and kits, and knowing how to use all the tools in your kit is just as important as having the kits in the first place. Take notice on how quickly your dog tires out with the pack loaded. If your dog cannot keep a good pace on a practice run, you may need to re-evaluate how much you have packed and what they are carrying. Bug out bags are optimized with inches and ounces, and a dog bug out bag is no different. Morale – Having a dog around as a companion can increase group morale and can work wonders for individual moral if you are by yourself. Alarm – Many dogs get vocal around intruders, even if they are on the smaller side. Having a ‘watchdog’ around usually helps instead of hurting. Hunting – Whether a dog points, tracks, or just plain chases other animals, many dogs are excellent hunters. While most of this instinct will need practice to be harnessed into skill, there is opportunity for them to help. Defense – Having a dog around for self defense is usually size and breed dependent. Even barking and growling smaller dogs can make an attacker think twice though. At the very least, even an unformidable dog can be a distraction buying you precious seconds in an altercation. Don’t underestimate the morale aspect of having a dog with you. Leaving them behind can set a dark tone of regret and “what ifs” for your bug out operation. If the dog truly would be a dangerous burden, prioritize yourself and your family accordingly. Just be sure to plan ahead. Cats, rodents, mini horses- all pets could benefit from a little forethought and planning before SHTF. While many of them cannot carry their own gear with saddlebags, you can still gather essentials for them. At some point you have to draw the line- I’m not getting a water bottle to carry fish around with me in an emergency. They might get an extra pinch of fish food before I hit the door. Just don’t get too impractical or complicated with your plans and try to keep it simple. A well-loved family pet cat could be worth putting together a kit for. Instead of the saddlebags, a cat is better served with a small crate. Zip tie a laminated picture of the cat and emergency info to the outside of the crate so you can be reached if you are separated. Beside the container that smaller pets would require, the rest of the requirements are generally the same as a dog: Food, water, tools, medicines, paperwork, hygiene items, and a toy. 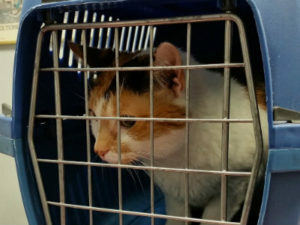 Cats can be leashed and harnessed, but crates are the way to go in an emergency. While cats aren’t going to carry their own load anytime soon, the crate is pretty lightweight and manageable for short distances or car travel. If my bug out location (BOL) was farther away, I would use a carrier with sturdy wheels. An 18 pound cat would get heavy real quick after the first mile or so. Everyone draws a different line at what types of pets they would leave behind, but making the decision ahead of time may save you some grief down the road. The last thing you want to be doing when SHTF is arguing whether the kids can bring Fluffy, their pet marmot. Set expectations and include them in your emergency plans. If you don’t have a plan for yourself and your family, you should probably look into that first. 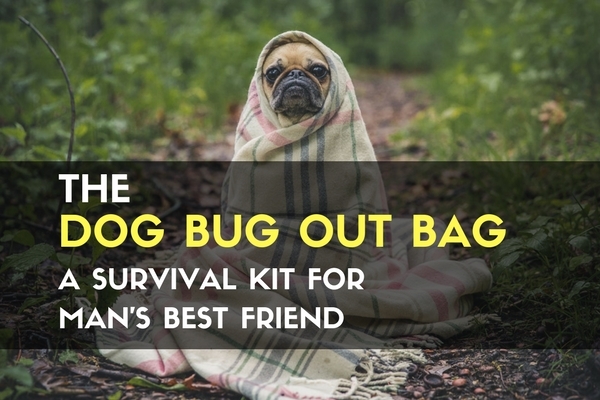 Check out our basic bug out bag list and make sure you are up to speed, and then get to working on your furry friends. If you plan now, you can make your pet an asset rather than a liability, keep family spirits up, and be ready for any disaster coming your way. Keep exploring, stay prepared, and be safe.